To learn more and register for the Acumos AI Challenge, visit the Acumos AI Challenge site today. There has been tremendous excitement around the potential for machine learning (ML) technologies that can be applied to Artificial Intelligence (AI). Businesses and investors have been nearly crazy over AI the past few years. Over $11 billion has been invested by venture capitalists (VC’s) in new AI startups during 2014-2016, with an estimated $6 billion more in 2017. Tech giants spent between $20-30 billion on AI in 2016 with technology and finance leading the way. Such investments have enabled numerous consumer services such as Alexa and Siri to become mainstream. Despite those successes, development and deployment of AI applications remain expensive in terms of time and the need for specialized talents. The lack of any common framework for its development has kept AI applications from becoming mainstream as a general solution to IT problems. Acumos is an Open Source Platform which supports training, integration, and deployment of AI models. By creating an open source community around Machine Learning, AT&T will accelerate the transition to AI-based software across a wide range of industrial and commercial problems. These advancements will reach a critical mass of applications. Acumos drives a data-centric process for creating machine learning applications. 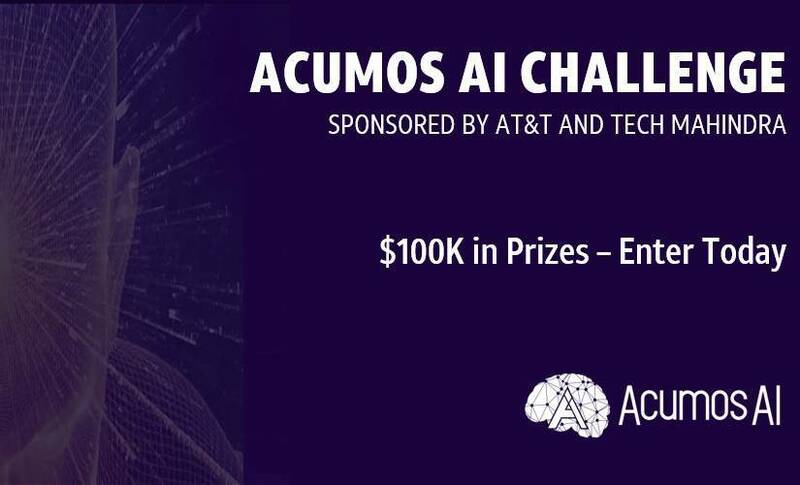 The Acumos AI Challenge is an open source developer competition seeking innovative AI solutions from students, developers, and data scientists. The Acumos AI Challenge will foster development of AI models for the Acumos AI Project, a product of The Linux Foundation. This impressive platform is supported by The Linux Foundation’s LF Deep Learning Foundation. The top three teams will each receive $25,000 cash, plus a trip to the finals in San Francisco in September 2018. The team that wins in the finals will take home an additional $25,000 grand prize, for a total of $50,000. 5G & SDN– Apps that improve the overall performance and efficiencies of 5G networks and Software-Defined Networking. Enterprise Solutions – AI models targeting an enterprise use case, including solutions for automotive, home automation, infrastructure, and IoT. The Acumos AI Challenge is accepting submissions between May 31 – August 5, 2018. The competition is open to U.S., District of Columbia, and Puerto Rico residents of a majority age. Teams are required to submit a working AI model, test dataset, and a demo video under three minutes. Teams can register for the Challenge beginning May 31, 2018. We encourage you to register early so that you can begin to plan and build your solution and create your demo video. Acumos empowers data scientists to publish adaptive AI models, while shielding them from the need to custom develop fully integrated solutions. It packages each model into an independent, containerized microservice, which is fully interoperable with any other Acumos micro-services. These micro-services will work regardless of whether it was built with TensorFlow, SciKit Learn, RCloud, H2O or any other supported toolkit. Models built with any of these tools or any supported language, including Java, Python and R, can be automatically onboarded, packaged and cataloged. These microservices are easy to integrate into practical applications, for any software developer, even without a background in data science or knowledge of any specialized AI development tools. Acumos provides a Marketplace mechanism for data-powered decision making and artificial intelligence solutions. Self-organized peer groups across one company or across multiple domains can securely share information among themselves. Many discussions and work will be integrated on how AI solutions perform — with ratings, popularity statistics and user-provided reviews, to apply crowd sourcing to software development. The platform aids communication between data scientists and application developers in order to automate the process of user feedback for selecting models while automating error reporting and software updates for models that have been acquired and deployed through the marketplace. Software developers will transition from a code-writing and editing toolkit into a classroom-like code training process. AI models can be acquired from the marketplace, trained, graded on their ability to analyze datasets, and integrated, automatically, into completed solutions. These devs can access encapsulated AI models, without knowing the details of how they work, and connect them to a variety of data sources, using a range of data adaptation brokers, to build complex applications through a simple chaining process. Unlike many proprietary systems, Acumos is not tied to any one run-time infrastructure or cloud service. Acumos creates an extensive mechanism for packaging, sharing, licensing and deploying AI models. These AI models are published in a secure catalog which is easily distributed between peer systems. Catalogs contain detailed information on ownership and execution requirements of individual microservices so that these can be easily searched with the Acumos Portal. This ensures model selection and deployment is a simple process. If you’re interested in the challenge don’t forget to register now and share this article with your friends and colleagues to compete for the $50,000 prize.